Ed and I were greeted by a dazzling display of fall colour as we dropped down into west Keremeos off the Keremeos Bypass. So captured by the sight of a mountain of gorgeous gourds piled high and gleaming in the early morning sunlight outside Gerry’s Fruit Stand, I had to stop and record the scene with my new Sony Cybershot DSC-T100 8 megapixel digital camera. While clicking away, a man who appeared to be the owner emerged from inside the store and greeted us. “You must be Gerry” I said. He responded lightly, “They call me Gerry, but my name is actually Dan“. 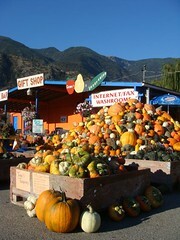 Dan Zacharias and his wife Sheryl have been operating Gerry’s Fruit Stand – located at 3045 Highway 3 in Keremeos, B.C. – for the last four years, and Dan admits that he’s still learning the gourd game. “Those are Blue Hubbards” he told me when I asked him the name of the large, light blue-green colored monsters. “I don’t have any Green Hubbards or Duck-Neck Squash this year. I looked for them [in the field], but I guess I didn’t plant any” he continued. OK, we weren’t going to say anything – but things just didn’t seem quite right at the stand without the Green Hubbards and Duck Necks. Ya right. Good Gourd, Dan! Only the most fanatical squash and gourd aficionado’s might have noticed have noticed Dan’s ‘gourd gaff’. Besides, according to my research, NatureHills online nursery doesn’t carry seeds for either, so they couldn’t be that great. You will find seeds for Winter Delicata, Black Beauty Squash, Straightneck Squash, Luffa gourds, Crookneck, Pattypan Scallop. There’s also Baby Round, Black Beauty and Lebanese Summer Zucchini; Acornh, Butternut and Spaghetti and more squash seeds at NatureHills though.